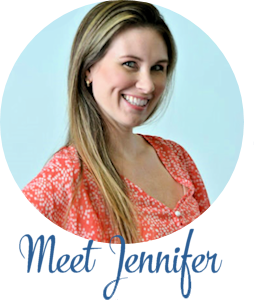 Award Winning Educational Toys Your Kids Will Love! 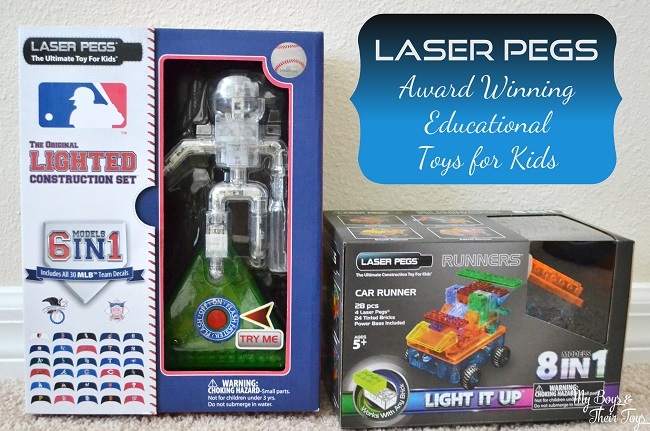 Laser Pegs continues to expand their line of educational toys while earning even more awards! 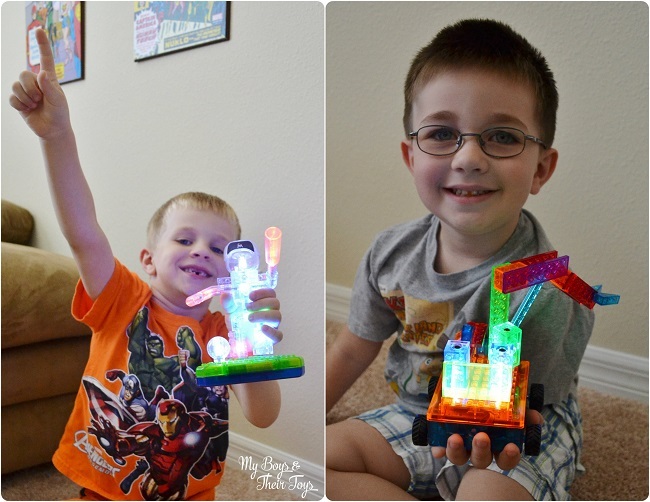 The Laser Pegs educational series includes light up building bricks that create landmarks, even partnering with National Geographic for new Oceans and Archaeology kits. 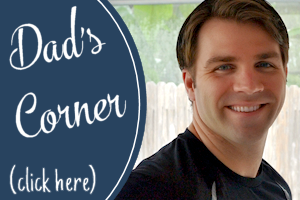 If you’ve followed the blog for some time you are quite aware of our love for sports. I do live in a boys world after all. 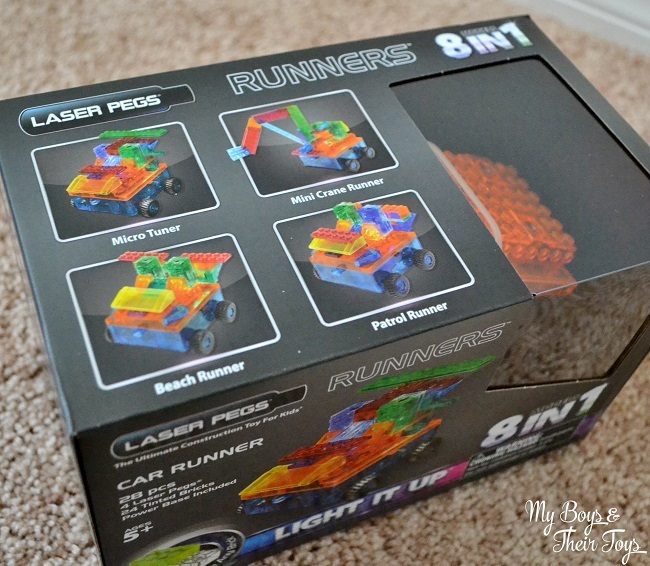 🙂 Recently we received the Runners 8 in 1 Set from the Light It Up Series and MLB Lighted Construction Set for review. 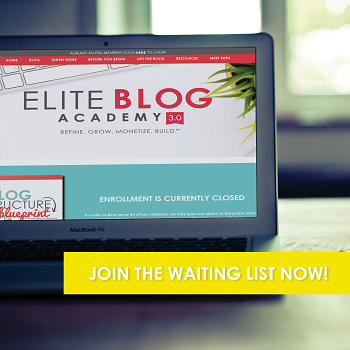 You can imagine the boys surprise to expand upon their building skills and watch the models they create light up. 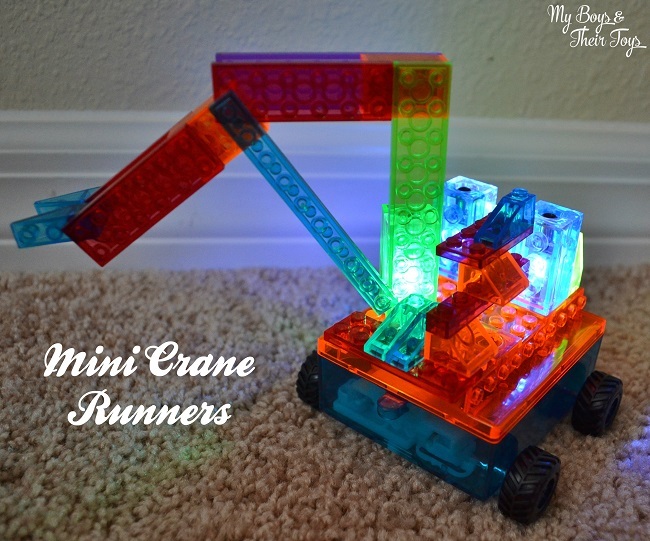 The Runners set is geared towards kids ages 5 and up and offers a variety of models to create including a beach runner, mini crane, safety truck and more. The base is ready to build upon and includes 4 wheels already attached. The instructions offer 1 model to create, but all additional model instructions can easily be located at laserpegs.com. I think this is a great way to save money and the environment by offering digital instructions. L decided he wanted to build the mini crane so after a quick search on Laser Pegs website I had the directions readily available, and within minutes my little guy was playing with his new toy. The base has a switch with 3 modes of play: light up, light up with wheels turning or flash lights with wheels turning. 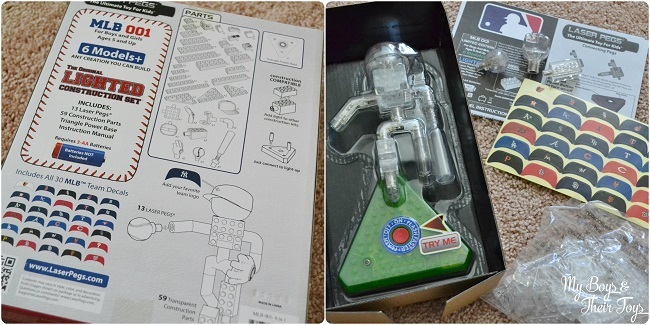 J is all about sports and was excited to customize his MLB player lighted construction toy. He chose the Florida Marlins hat for his player to sport and decided to build the “Calling the shot” model. 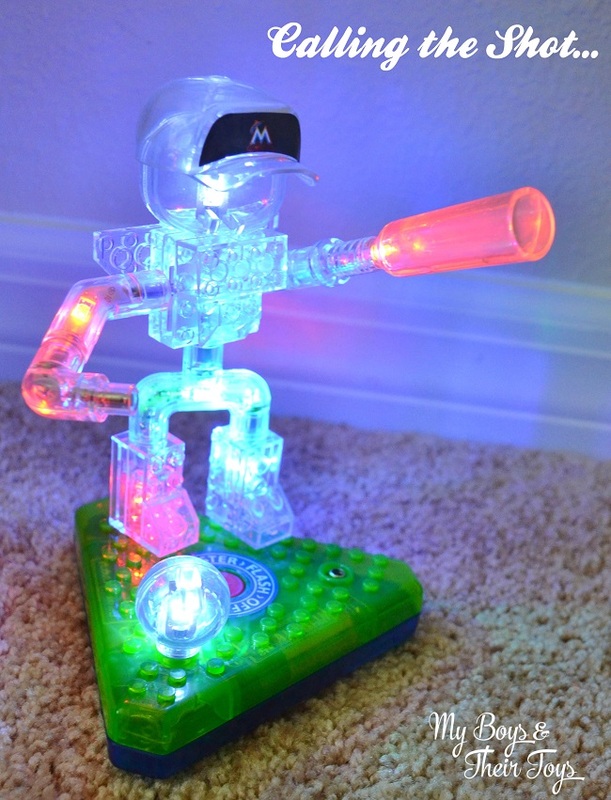 With a few quick steps his toy was ready and with a press of the button his MLB player would light up or flash. Batteries are required and sold separately. Both boys love their new building toys, and I appreciate that they are innovative and educational toys too. 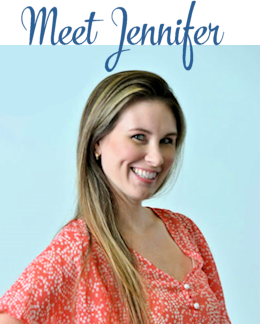 Both sets featured on the blog today are currently priced at just $20! Another Laser Pegs toy that caught my eye was the Educational Kit that includes a liteboard with letters and numbers blocks. This toy is great for toddlers developing and building on those beginner skills like counting and spelling. If you prefer toys for your kids that offer educational benefits, I highly recommend checking out the full line of construction sets at Laser Pegs. Find them online or at specialty toy stores and amazon.com . Which educational toys do your kids enjoy? I think the runners light it up is really cool. Love the lights because I can picture my boys in their rooms at night doing these. Oh I love this! I’ve been reading reviews on toys to make sure I’m aware of what is available to purchase for the holiday gift giving and I can see why both of these would be an awesome gift. These are genius! 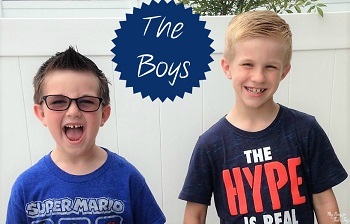 My boys would love these because they’re actually FUN! Thanks for sharing. This is exactly the sort of thing that I loved as a kid. Between the lights and the moving parts, this one toy set does more than any single toy that I ever had. I have never seen these Laser Peg toys before and love them. My niece and nephews would so love these. 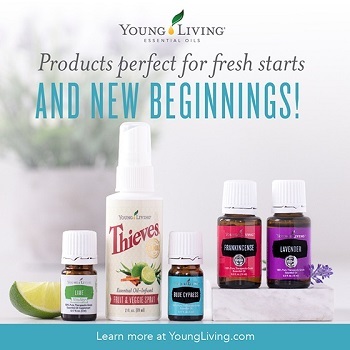 I will have to check them all out. Thanks for sharing. The Runners 8 in 1 Set from the Light It Up Series is super awesome. I only have girls but i think this toys are awesome for any gender. Its the first time i hear about Laser Peg toys!